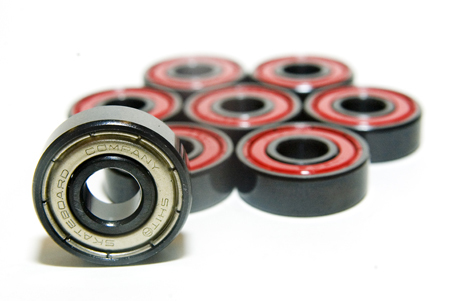 We’ve all had questions about bearings and debated the pros and cons on different brands and ABEC ratings but few of us have gotten solid answers about the myths that surround bearings. Ask no more, as we’ve found answers. The fact is that no matter which of these bearings you use in skates or skate boards, after 5 – 10 minutes of use the tracks won’t just be eccentric, they will become irregular (albeit minutely) enough to be practically indistinguishable from one another. Your high priced ABEC 9 bearing might as well be a 50 cent ABEC 1 cheapie. They also give some advice as to how you can get more speed out of your bearings. No, WD-40 won’t cut it (in fact it’ll slow you down as WD-40 attracts dirt, dust, and grime) instead you should invest in a high-quality oil-based bearing lube and make sure your bearing seals are nice and tight. These combined will have you going faster than before and make sure you have a consistent ride. So what does it all come down to? Most of the bearing hype is just that — hype. Instead of investing all your money in an ABEC9 bearing go for a lower grade and put the savings into that new set of wheels you need so bad. As far as skating goes, you’re not gonna miss the precision you get from the higher grades, you’ll probably miss the dough you’d spend, though. Check out the full FAQ here.